HomeLatest News2013-05-27: *New* Everything you need to know about TZIPAC E-Badges !! How TZIPAC E-Badges work: Every qualifying image - as specified by competitions' call-for-entries - will carry an individualised TZIPAC E-Badge featuring your name and award title. 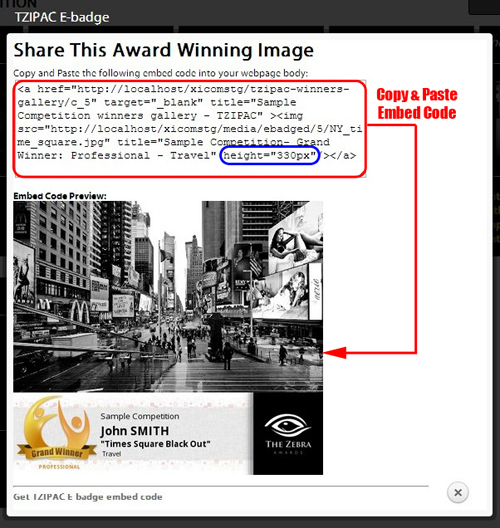 Sharing your award-winning image with TZIPAC E-Badge is as simple as "copy&paste". To access your E-Badge easy-share embed code, locate our small E-Badge award icons next to your qualifying entries. 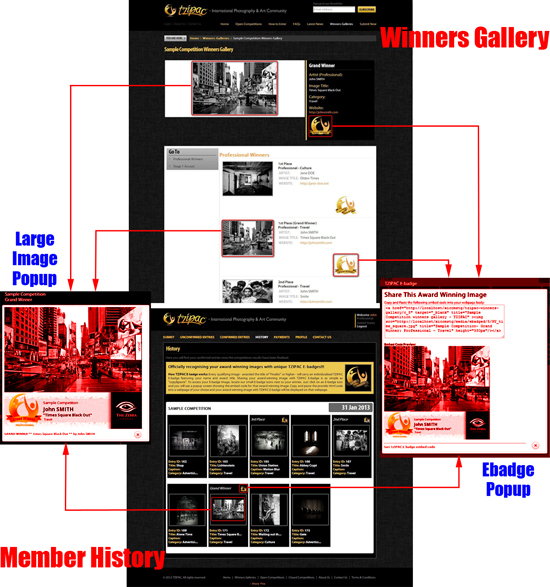 Just click on an award icon and you will see a popup screen showing the embed code for that award-winning image. Copy and paste the provide HTML code into a webpage of your choice and your award-winning image with TZIPAC E-Badge will be displayed on that webpage. A TZIPAC E-Badge is a banner attached to the bottom of an award-winning image to official recognise the achievement of that image in a TZIPAC competition. Each E-Badge features details about: the entrant's name and professional status, the image and its title, the competition, the category and the award won (via the E-Badge award icon located in the left-hand-side of the E-Badge's banner). Where to access TZIPAC E-Badges? TZIPAC E-Badges are accessible from: our winners gallery and member history (login required). In either page, you can (1) view the E-Badges by clicking on the qualifying image's thumbnail or (2) access your easy-share E-Badge embed code by clicking on the E-Badge award icons located next to the qualifying images. 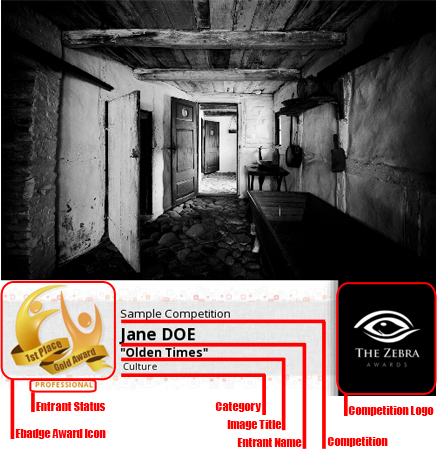 Of course, member history will only show YOUR OWN entries and only award-winning entries will have TZIPAC E-Badges. How to share TZIPAC E-Badges? Sharing your award-winning image with TZIPAC E-Badge is as simple as "copy&paste". Firstly, locate and click on the E-Badge award icon next to the qualifying image that you would like to share. This will open the E-Badge Embed Code popup window (see the snapshot shown below). Then, just copy the HTML code provided and paste it into the <body> of a webpage of your choice. The E-Badge will then appear on that page, similar to the preview shown in the E-Badge Embed Code popup. In the embed code, we have restricted the E-Badge size with the code height="330px" (highlighted in blue in the snapshot above). You can easily modify the number in this part of the HTML code to show a larger or smaller version of the E-Badge. For example, to show the E-Badge in its full-size, simply delete the text height="330px" from the HTML code. However, please note that displaying the E-Badge larger than its full-size will affect image quality - TZIPAC E-Badges are created with a maximum width of 550px. If some E-Badges do not load properly in a winners gallery or member history then please try to refresh the page using "Ctrl + F5". Open the E-Badge Embed Code popup window. Right-click on the preview image and select option to "Open image in a new tab". Go to the new tab. If the E-Badge does not look right here, then try to refresh using "Ctrl + F5".